It's more than likely you keep tabs on your calorie consumption and calorie exertion. But, like many of us, you probably wonder how much energy is burned when you head to the pool for a training swim. Swimming is, without question, an effective way to torch calories. And, since swimming is a non-impact sport, it's neutral on common problem areas like the lower back and knees. So if you're plagued by injury, it's a great option for many adults looking for an energy-burning activity. But how much of a calorie-burning workout is it, truly? And how does it stack up to other endurance activities like running and cycling? The answer varies, but we do have a few numbers you can chew on. There are a number of variables to consider. First, your weight plays a big factor in how much is burned. Generally, the more you weigh, the more you burn. But to make things even foggier (goggle pun), a person's metabolism is also a factor in how many calories are burned, and metabolism varies no matter what your weight is. It's difficult to calculate individual metabolism, so these numbers are based on basal metabolic rate for average people in a variety of weight classes. The site nutristrategy.com has estimated from research data from the American College of Sports Medicine. These estimates are based on one hour of swimming, rather than the total distance an athlete covers. A 130-pound person swimming freestyle for one hour will burn 590 calories swimming fast, and 413 calories swimming slower. A 155-pound person swimming freestyle for one hour will burn 704 calories swimming fast, and 493 calories swimming slower. A 180-pound person swimming freestyle for one hour will burn 817 calories swimming fast, and 572 calories swimming slower. A 205-pound person swimming freestyle for one hour will burn 931 calories swimming fast, and 651 calories swimming slower. The estimates don't stop at freestyle. Generally, swimmers will burn the same amount of calories doing backstroke than they will doing a slower freestyle, according to Nutristrategy. 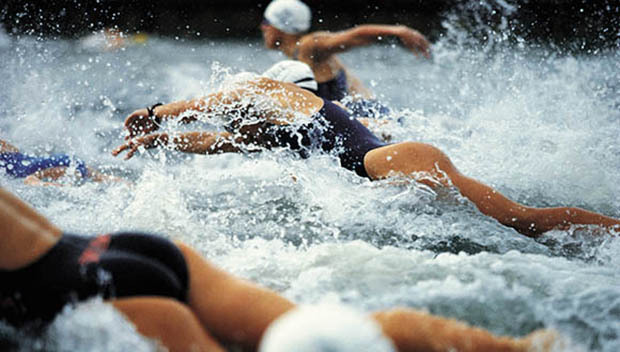 Swimming breaststroke for an hour will burn a similar amount of calories to doing a fast freestyle workout. For the king of calorie-burning swimming workouts, though, swim an hour doing butterfly (if you dare). The calorie torching ranges from 649 calories for a 130-pounder to 1,024 calories for a 205-pounder.